PROMONTORY, UtahJun. 28, 2016-- Orbital ATK (NYSE: OA), a global leader in aerospace and defense technologies, in partnership with NASA, today successfully completed the second of two booster qualification motor tests (QM-2) for NASA s Space Launch System (SLS). Preliminary data indicate the motor performed well and provided the necessary data toward meeting our test objectives. Orbital ATK developed the two five-segment rocket boosters for NASA s SLS, a heavy-lift rocket designed to enable exciting new deep space exploration missions. For today s test, Orbital ATK technicians pre-chilled the QM-2 motor over the past month to 40 degrees Fahrenheit in order to test its lower temperature capabilities against the expected temperature range in which SLS may operate. The first qualification motor, QM-1, completed a successful test last spring that validated motor performance at the upper end of the propellant temperature range (90 degrees Fahrenheit). 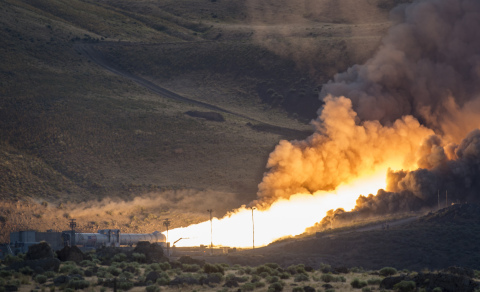 The NASA and Orbital ATK team has done an extraordinary job of collaborating to make this test a success, said Charlie Precourt, general manager and vice president of Orbital ATK s Propulsion Systems Division. SLS is America s rocket, and it is very exciting to know Orbital ATK s boosters will play a big part in launching our astronauts out of Earth s gravity and on to deep space. Lying horizontally in the test stand, the QM-2 motor is 154 feet in length and 12 feet in diameter and is the world s largest human-rated solid rocket motor in existence. These boosters produce 3.6 million pounds of maximum thrust, more thrust than 14 747-400 jets produce at full takeoff power. The flame exits the motor at Mach 3 and burns for a full 126 seconds. Orbital ATK and NASA will use test measurements from more than 530 data channels to analyze motor performance, acoustics, motor vibrations, nozzle modifications, insulation upgrades, Booster Separation Motor structural dynamic response and nozzle vectoring parameters. Based on the design heritage of the flight-proven solid rocket boosters used on NASA s Space Shuttle, the SLS five-segment motors incorporate new technologies and updated materials. Orbital ATK is also providing critical propulsion technology for the astronaut safety system aboard the Orion spacecraft, which includes the launch abort motor and attitude control motor. The SLS, along with the Orion spacecraft, provides a flexible deep space exploration platform to take humans and cargo to multiple destinations across our solar system. The building blocks for NASA s journey to Mars are in place and are gathering strong momentum, said Precourt, a four-time space shuttle veteran. I am proud that our company s technology will be a vital part of the SLS program s success and of our team s important contributions to the next chapter in man s exploration of space. The first test flight of SLS and Orion together, called Exploration Mission-1 (EM-1), will be uncrewed and is scheduled for late 2018. During EM-1, SLS will use two of Orbital ATK s five-segment solid rocket boosters. Orbital ATK has 29 key SLS booster suppliers across 16 states including Alabama, Arizona, California, Connecticut, Indiana, Kentucky, Massachusetts, Minnesota, New Jersey, New York, North Carolina, Ohio, Pennsylvania, Texas, Utah and Wisconsin.